Patrick Coyle is the vice president for Young America’s Foundation. 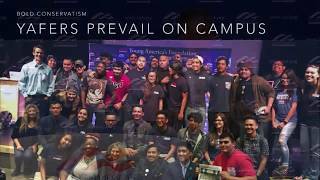 Human Events named Mr. Coyle as one of the top ten young conservative activists in the nation, citing his success in reaching hundreds of thousands of students by sending high profile conservative speakers to college campuses. He is also co-editor with Foundation president Ron Robinson of The Conservative Guide to Campus Activism and wrote the Campus Conservative Battleplan, both of which are published by Young America’s Foundation. His success has made him a target of a radical leftist website that has published his home address and phone number in an attempt to stop his conservative activism. Mr. Coyle is also responsible for overseeing student programs including creating and implementing new activist initiatives, resources, and materials. A few of the programs created under his tenure include the 9/11: Never Forget Project, No More Che Day, and Freedom Week. He also developed and runs the Foundation’s activist rewards program, Club 100, which has over 2,500 members from over 500 colleges and universities across America. Mr. Coyle also serves as the executive director of Young Americans for Freedom which is a project of Young America’s Foundation. Mr. Coyle works with students to establish YAF clubs on campus in order to promote conservatism. He is also chairman of the board for the Young Americans for Freedom Foundation. Mr. Coyle is a graduate of Penn State University, where he first became active in the Conservative Movement by joining the Penn State Young Americans for Freedom (PS-YAF) of which he eventually became chairman. During his years with PS-YAF, he battled against the liberal orthodoxy. The Rush Limbaugh Radio Program featured a protest he organized against a liberal political science professor. He also worked with the Foundation to bring numerous speakers to his campus, including Walter Williams, G. Gordon Liddy, and MTV VJ, Kennedy. He has been quoted in Time Magazine, The Washington Times, Washington Post, The Los Angeles Timesand the Atlanta Journal Constitution and his speeches have been covered by C-SPAN.